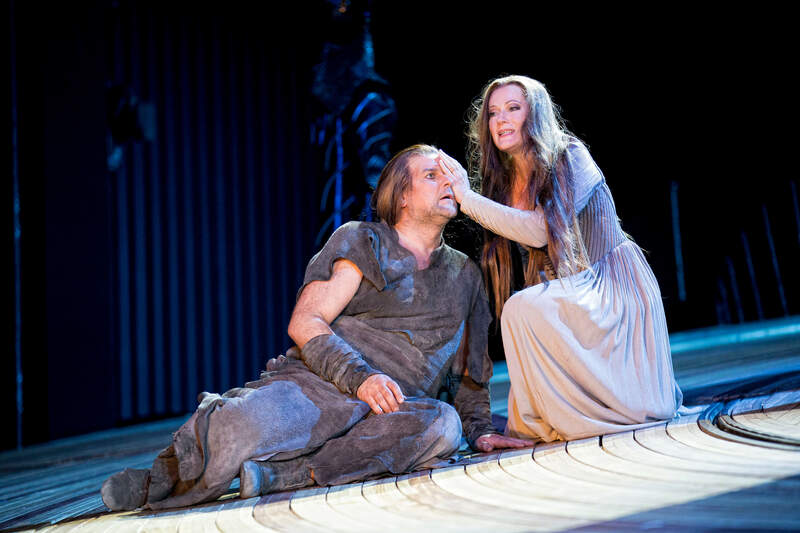 Bellini’s Norma is not an easy opera to stage. The demanding title role requires a soprano with considerable vocal as well as dramatic talents in order to convey the character’s various emotional states. For stage directors, the challenge lies in dealing with the grand gestures of melodrama as well as the large amount of time spent on the expression of emotions rather than actions. 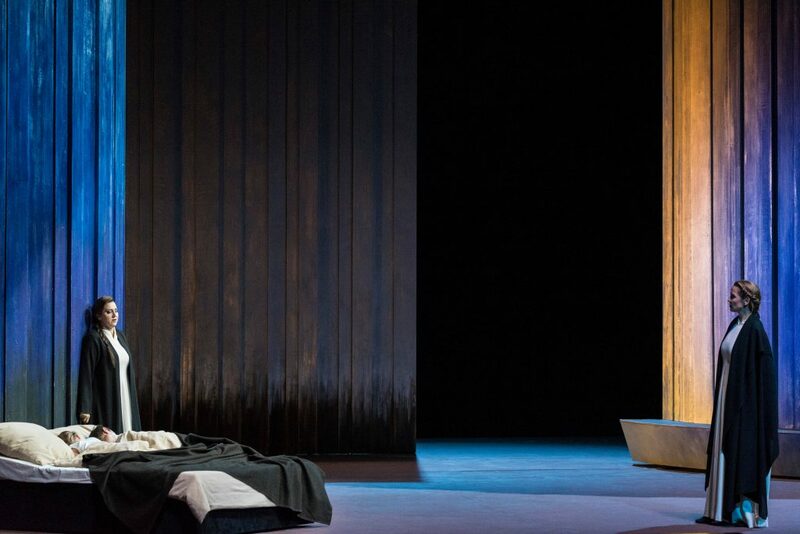 The Aalto Opera in Essen has managed to present an effective production with a truly splendid cast, headed by the dramatically and vocally thrilling Katia Pellegrino as Norma. The new production by Tobias Hoheisel and Imogen Kogge does not feature Romans in shiny armour and Gauls in typical barbaric garb. Rather, the duo opts for timeless and stylized sets and costumes that support and complement the drama. The set consists of two wooden cylindrically-shaped pieces of scenery that can be rotated in such a way as to present the two different types of space in which Norma finds herself. They can be positioned so as to create a large ‘open space’ on stage, with a stone altar and a glass disc representing the moon at the left side of the stage. This is the outdoors, the public environment in which Norma has to play the part of pious priestess. The cylindrical shapes can also be rotated in order to create a much more intimate space. The presence of a bed makes clear that this is Norma´s private domain, where she can temporarily drop her façade and be her impassioned self. It is also where she has hidden her greatest secret: her two children with Pollione. The costumes are timeless and stylized as well. Norma and the younger priestesses are dressed in floating white robes. Oroveso, Norma’s father, and the other druid priests wear a monk-like garb that looks vaguely Asian. The eager warriors of Gaul also wear costumes with a seemingly Asian tinge. By contrast, Pollione is dressed in a costume that makes him resemble an early 20th-century European gentleman. This difference in costumes between Romans and Gauls, then, seems to illustrate the cultural differences that divide the two groups. The costumes of the priestesses, however, look rather neutral. This seems suggestive of the in-between position that at least two of them, Norma and Adalgisa, have taken up. 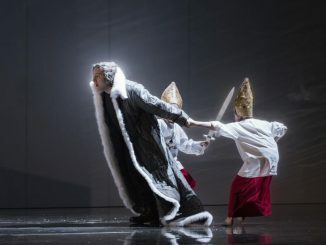 What makes this production especially effective, however, is the fact that Hoheisel and Kogge embrace the opera for what it is – a work of extreme emotions and grand gestures – and don’t try to push it into any other theatrical mould. 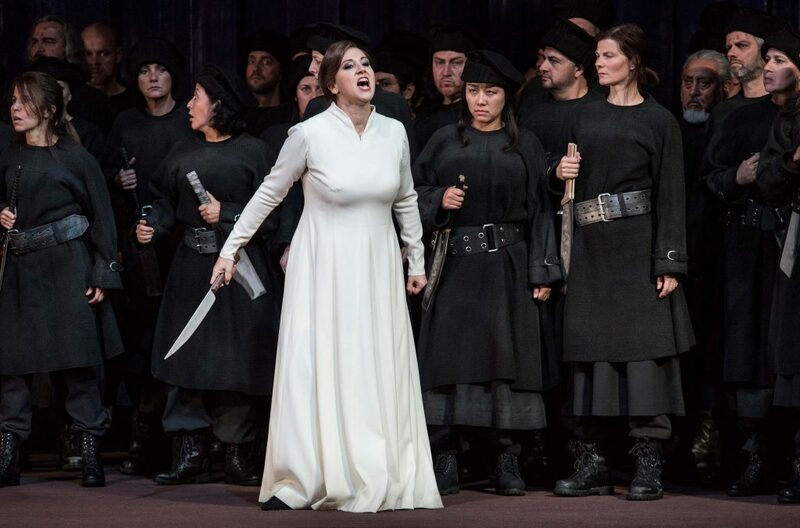 As Norma, Katia Pellegrino managed to deliver a dramatically and vocally thrilling and moving performance. She produced impeccable coloraturas, and sang with a steady voice, which features impressive deep low notes and seemingly endless ringing high notes. Pellegrino’s stage presence was powerful and charismatic, conveying the broad palette of Norma’s mental states grippingly. Her gestures and the glances she cast at Pollione and Adalgisa were far from subtle, yet were perfectly appropriate for the fiery priestess. 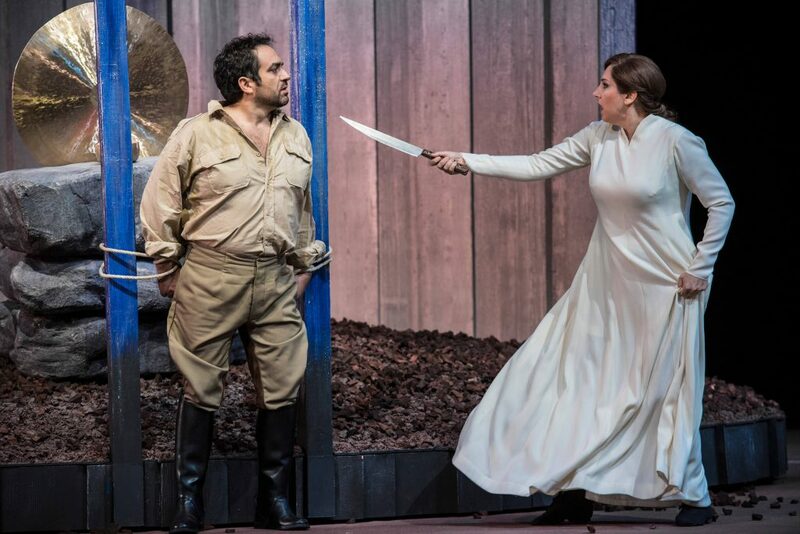 In Gianluca Terranova as the Roman proconsul Pollione, Pellegrino’s Norma found a vocally strong match. Terranova managed to sing the mellifluous, tender parts of his role nicely, while also being able to muster up enough vocal power and stamina to hold his own in the more tumultuous confrontation scenes. His acting was a little stiff at times, but at the crucial moments, he managed to convince. Bettina Ranch, a new addition to the ensemble of the Aalto Opera, sang a marvellous Adalgisa. She possesses a dark and agile alto voice, which blended impressively with Terranova’s tenor and Pellegrino’s soprano. Ranch convincingly portrayed Adalgisa as a strong and sensible woman, almost the polar opposite of the histrionic Norma. Insung Kim portrayed Oroveso convincingly with a resounding bass voice and a cool and distant acting style, which made it completely understandable why Norma kept him in the dark about the existence of his grandchildren. The Essener Philharmoniker was conducted by Giacomo Sagripanti, who won the award for best young conductor at the 2016 opera awards. Sagripanti kept up a brisk pace in his conducting. For the most part, this worked wonderfully and lent the performance a gripping sense of urgency. I would urge everyone who craves an evening or afternoon of bel canto at its very best to head over to Essen for this truly exciting and deeply moving Norma. A magic? unforgettable opera night❤ will never forget? BRAVO? BRAVISSIMO AND IN BOCCA AL LUPO IN THE LAST PERFORMANCE ON THE 1ST NOVEMBER❤ GRANDIOSO POLLIONE AND NORMA? GRAZIE?